All aboard! It’s always a joy to see Dermot sending the X Factor finalists’ battlebuses on the road – indeed, this segment of the show has become a running joke in these parts since he banged the side of Fleur’s bus as it departed the studio in 2014. It will, of course, have been pure coincidence that Dermot delivered the closing monologue to yesterday’s show with the message “Vote Rak-Su” prominently displayed over his shoulder, while Kevin was directed to the far end of the car park. The Sunday show indicated that producers must have been comfortable with the state of the vote after Matt’s departure on Saturday. They didn’t feel any need to treat Lloyd badly, giving him a lovely VT about opening for Little Mix, and beautiful staging for his rendition of ‘Fix You’. Comments were kind, if noticeably lacking in appeals for Wales to pick up the phone – indeed, Sharon called on people to vote for “everyone”. The likeable Lloyd endeared himself further by using his Dermot departure interview to thank the backstage staff. His exit interviews have included the line “at the moment with my chest infection I have to take it easy”, which backs up the theory that Sunday’s double elimination may have been prompted by doctors raising concerns that Lloyd’s health might not stand up to a full-on week’s worth of being ferried around Wales on a battlebus. There was no real indignity for the Cutkelvins, either – at least if you don’t read The Sun – with an anodyne VT focusing on everyone else’s favourite songs, and comments that gently downplayed their prospects of making it through after Simon seemed to visibly hesitate about whether or not to stand for them. Producers even had the confidence to put them on after Rak-Su for the second time in five shows, perhaps alert to any possible risk of backlash about perceived favouritism. Indeed, this is yet another area in which producers have played a blinder this season. 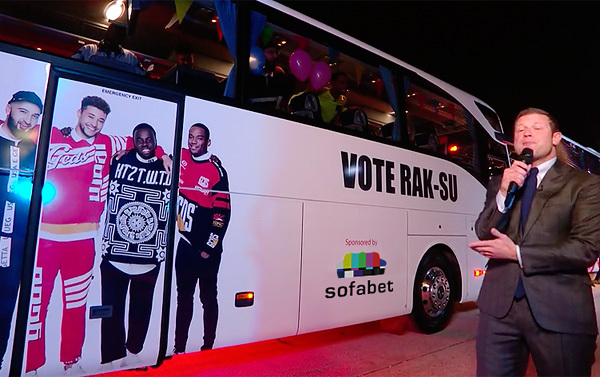 While the consensus among Sofabet commenters remains that Rak-Su look like the winners TPTB would prefer to have, the most visible indicator of favour – late slots in the running order – have been shared out evenly: the three finalists have now had two pimp slots apiece, and one penultimate slot. Rak-Su were put in second, with staging that was more “urban” than we’ve previously seen for them. Producers were clearly confident that returning to room audition song ‘I’m Feeling You’ would be enough to get them through. It’s currently another #1 iTunes hit for the lads, with Grace’s ‘Wolves’ at #5 at the time of writing. It was Grace who got the Sunday pimp slot, with all four judges standing after a punchy performance of that new original number, and emphasising how much she deserved to be in the final as she emotionally appealed for the chance to reprise ‘Roots’. Sharon commented that Grace has a hundred other songs ready to go, and she nodded vigorously. By contrast, Kevin’s original material hasn’t been mentioned since he performed one of his own songs to Nicole at judges’ houses. Kevin was seriously bigged up again after a performance of ‘Voodoo Child’ that – as Louis pointed out – felt surprisingly unlike the X Factor. Current odds give Rak-Su around a 67% chance of winning, Grace around 23% and Kevin 10%. That reflects a sense that producers will want Kevin to bring to the final a feelgood vibe, showmanship and an aura of musical artistry – but not to trouble the songwriters who are doing the business on iTunes. 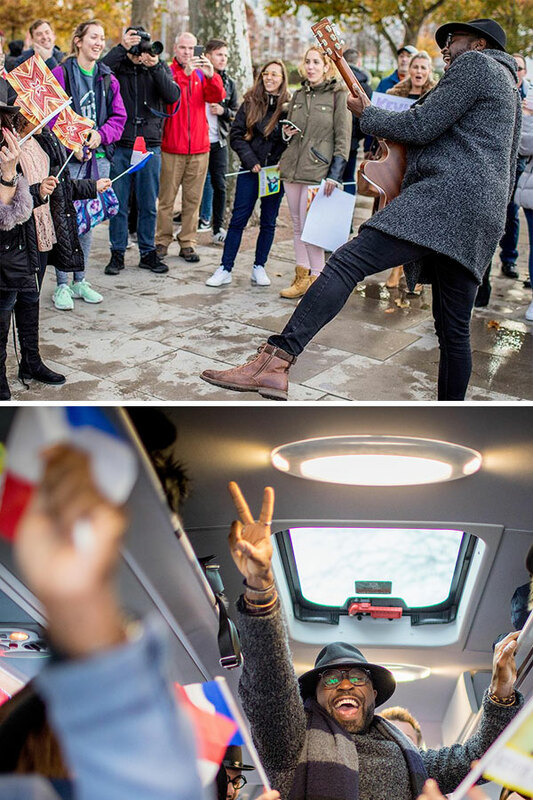 Kevin’s spent today playing his guitar at tourist hotspots; and are those French flags on the battlebus? Do the odds tally with your perception of what producers would like to happen, and their likely ability to achieve it? As ever, do let us know below. I am 99% certain that TPTB want Rak Su to win and I’m 90% sure they’ll get them over the line so I think the 67% looks value but such bets are not my cup of tea. Or are there other rumours? Actually, P!nk is in the UK this week, as she’s doing The Graham Norton Show in a few days. Would any of P!nk’s songs be suitable for Grace though? I was thinking they’d do her recent one “What About Us”, she is confirmed to appear on the show this weekend, so seemed like an obvious match to me. Sean + Conor Price and The Cutkelvins already did that song though, but it’s possible. For a series that’s quite good with song choice variety, having this song again is quite anomalous. I don’t know if Pink would agree to singing with a talent show contestant. Has she done it before? They’ve seemed to struggle to get big artists to do it in recent years. I’m expecting James Arthur for Grace and Craig David for Rak-Su. it’s the budget version of Beyoncé-Boyzone-Westlife from 2008. The only thing about that line up is who is going to sing And I Am Telling You? A Nicole and Kevin duet could be dangerous; statistically, every time Nicole has been a duet partner, her act has gone on to win it. That doesn’t mean they won’t risk it though. Little Mix for Rak-Su seems solid. I’m not sure if Pink would do it though, she seems like too big a name to do one compared to their recent past partners. Grace performing 3 originals and a “classic” according to Sharon. She said she wanted to duet with james arthur and wouldn’t be surprised if that happened. What’s Craig David up to this weekend? I’d be astonished if he didn’t show up for Rak Su’s duet, seems like the obvious choice and has a good relationship with the show. Yeah, I suppose Craig David has to be the fav for a Rak-Su duet after they referenced him in their song Flowers on Saturday. I was really surprised they didn’t cover Craig David last week – a far more relevant choice than SFA – so maybe they wanted to save him for the final? No…You’re thinking of Saturday 9th December. Yeah, you’re right… This early final date still throwing me off kilter! Craig David could be the shout in that case, but I feel like they could do with someone younger and ‘cooler’ rather than someone older, albeit on the crest of renaissance. I notice that Little Mix have deleted a tweet they put out a couple of weeks ago publicly supporting Raksu for the win. Not sure why they’d do this… Switching sides now they’re on the show? (although I’m pretty sure they’d have known for a while that they were going to be performing). Not related to the final, but the last slot on the XF tour will be determined by a Sun poll. Assuming this can’t be geo-locked, judging by Tellymix, it will be Alisah, then. It simply has to be Alisah, I don’t think there is any doubt that it will be her, by whatever means. I doubt that she is sticking around in the UK just to turn the Xmas lights on in Grimsby and open the latest Lidl in Hull. If it is Alisah it will be an absolute joke. Holly and Rae Elle were completely shafted this season, when they would usually be the kind of act hyped to the final. Based on the social media reaction towards her (YT views, backlash on other Girls when she was eliminated), it looks like she will win, but I have a few caveats. Given that The Sun runs the poll, can people connected to XF/the tour tip the scale and vote for the act they want? Are there no controls for this? Also, not sure how UK work visas operate but I don’t think they will go out of their way to use up Alisah’s visa’s validity. An act like Rai-Elle would add more to the tour, to be honest. I watched back all of Rak-Su’s performances this morning and they actually are pretty good. I don’t think there’s ever been a more entertaining act on the show. Better singers yes, but belting out a Karaoke classic isn’t really entertaining is it? They remind me of K-Pop acts (as a fan of both): it’s not just the songs, but also the visuals that are in sync with their whole concept. I thought they would look silly when the Lives came but they looked more cohesive than ever.